Have you noticed that the yogurt display at the grocery store is now enormous? 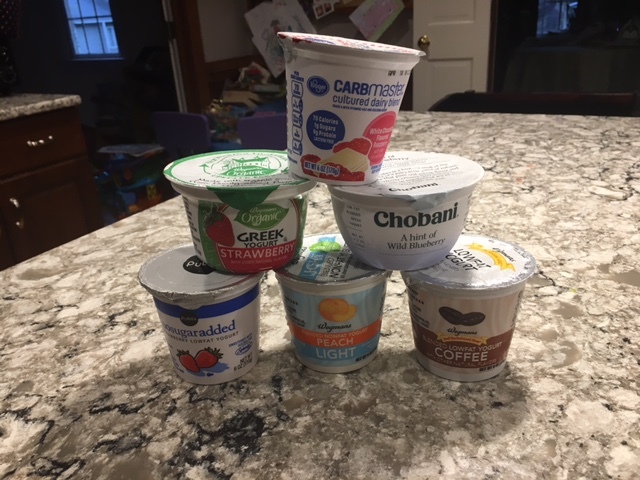 Shelves upon shelves of choices, all touting “less sugar” or “lower fat” or “new flavors.” Speaking of flavors, with choices like blueberry pie and white chocolate raspberry, is yogurt a dessert or a snack? I love yogurt, and in fact I eat it for breakfast with some granola, for a mid-day snack (sometimes with a few nuts mixed in), and often for dessert (when I really want ice cream, but am watching my diet). But last week, I am embarrassed to say, I made a tragic rookie mistake. I was looking for fun, dessert-like flavors, and I picked up a “Vanilla-Orange Creamsicle” flavored yogurt that said LOW FAT in big letters. I tore it open yesterday, and it practically knocked my socks off— wow, this is sweet! It must have lot of artificial sweetener I thought, but when I looked at the back of the cup, I couldn’t believe my eyes. This “healthy” yogurt had only 2 grams of fat, but a whopping 34 grams of carbs, 29 grams of sugar and only 5 grams of protein. The second ingredient was Sugar. Say what?? I eat yogurt for the gut-healthy probiotics, for the protein that will keep me full longer, and for a little sweetness without the carbs! “Kroger’s CarbMaster” – 5 g carbs, 9 g protein. So, what should you look for? If you need something to quash hunger, a snack or quick meal, go for more protein, like a greek yogurt that’s still lower in sugar. I vote Chobani’s new “Just a Hint” greek yogurts. Toss in some almond slivers for crunch. If you want a low-carb option that’s a good dessert after lunch or dinner, don’t worry as much about protein and just try to keep the carbs low. I vote Kroger’s Carbmaster. In any event, don’t be mislead by promises of “Low Fat” or “No Sugar Added,” but read the label before you buy!! !